I gave a recital a few days ago at Stony Brook University as part of my work towards a DMA. It is an hour of solo piano, mostly original material with a few jazz standards thrown in at the end. I’ve divided it up into a few tracks, and posted it on Sound Cloud here. I’d pleased to hear your response. In June of 2009, the Bloomingdale School of Music presented a composition of mine which I called ‘Sonata for Improvised Piano’. An excerpt appears above. The piece exists in two versions, one completely written out, and the other written with a combination of graphic and conventional notation. The piece was designed as an entry way into composition for classically trained pianists who may never have improvised before. In this particular concert, the piece was presented three times. Bathsheba Marcus Conley and Katy Luo, both fine pianists with an interest in contemporary composition, each played an interpretation of the piece. I played the piece in its written-out version. Neither Bathsheba nor Katy had ever improvised publicly, and neither had heard the other or me prior to the concert. To my ears they were both a smashing success, and it was great fun for me to hear 3 entirely different but related performances. The program notes follow, as well as 3 audio versions of the first movement. The finished pieces are the result of a kind of dialogue between improvising through these images, and composing through them. The 3 pieces are separate, but together constitute one “dream” with 3 episodes. The verbal directions are meant to be the main guide through the piece. They do not form an entirely coherent narrative, but flow from one image to the next as in dreams. They are a combination of visual image, feelings and active-verb directions. To play the pieces, the performers are following the verbal directions and images, as well as using musical material I have provided. 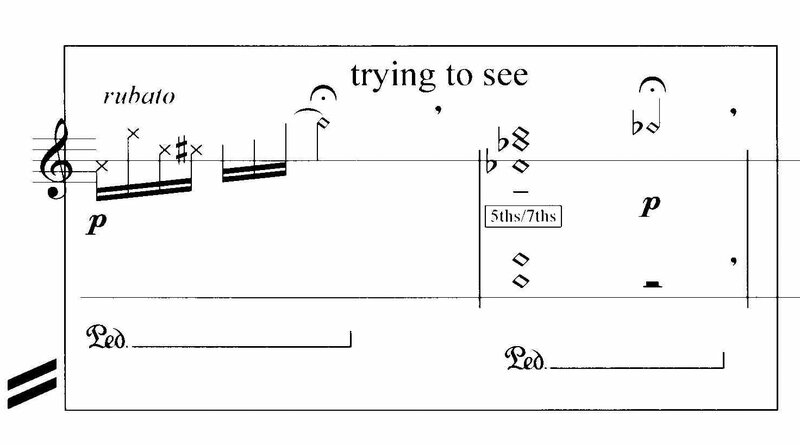 There are specific musical instructions to be carried out, which appear in the score in boxes, and suggested material which appears between the boxes as the player reads through. It is as though the boxes are “islands”, and the player’s job is to swim from musical island to musical island expressing the verbal directions as she goes. In each improvised movement, there is a passage written in standard notation which I ask the performer to play exactly as written. Since this afternoon’s concert will contain 3 performances, these will be “islands” for the listener to grab on to as well! Here are three versions of the first movement from that performance. The first two are improvised, the third is from the written-out version. This movement is quiet and slow moving, with lots of open space. 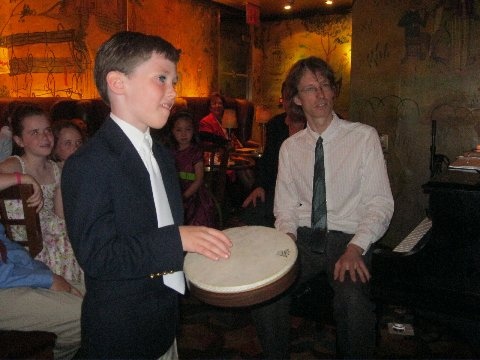 In December of 2009, I presented a concert of solo improvised piano at the Bloomingdale School of Music. Here are the program notes from the event. I have posted a few mp3’s from the evening, as well. Unlike the magician’s art which is betrayed by divulging its secrets, the improviser thrives on listeners who are ‘in’ on the game. One of my main sources of musical pleasure is in experimenting with different ways of improvising. Here are the rules and parameters I’ve set up for myself for this evening’s concert. The Bach Partita that I am using (No. 1) has six separate movements or sections, and I will improvise my way through them in their original order. They are written using the form, style and rhythms of particular dances popular in the Baroque era. I will attempt to follow Bach’s basic harmonic plan (with an occasional straying here or there), and hope to gather melody, motif and phrase along my walk. Though I do aim to retain the basic feeling of the original dances, I allow it to be filtered through my own rhythmic language and musical experiences. Sometimes as I move through the piece I feel as though I am wandering from room to room in a fantastic old house, and I occasionally find myself compelled to improvise a transition from one room to the next, perhaps reflecting on what I have seen. For those keeping track of my progress, I will attempt to make clear where I am in the house at any given moment! I have chosen five Debussy preludes, all from book II, for the next part of the program. These are highly evocative pieces which employ the full range of the piano’s possible dynamics, timbres, and textures. I have abstracted certain rhythmic, register, and intervallic information (you will notice me reading music) which I will use to create my own narrative in the spirit of each prelude. Because the harmonic language will be my own, these improvisations will be more of a departure from the original than the Bach. The program will conclude with 4 original compositions. Though they do exist in written form, these short pieces have stubbornly refused to be played in any one particular way, and so it seemed appropriate to include them. Tempo, dynamics, meter, texture, orchestration are all up for grabs. Some days they seem to become a showcase for my left hand, all too busy with other chores to be allowed to make melody itself! These pieces share a certain harmonic elusiveness, influenced perhaps from contemporary jazz composition. Jazz tends to favor the ‘theme and variation’ form of improvisation, but I will play through the form of these pieces several times with melody largely intact. Sections may expand or contract, interludes may occur, but hopefully the theme itself will give the listener something to ‘hold on to’. 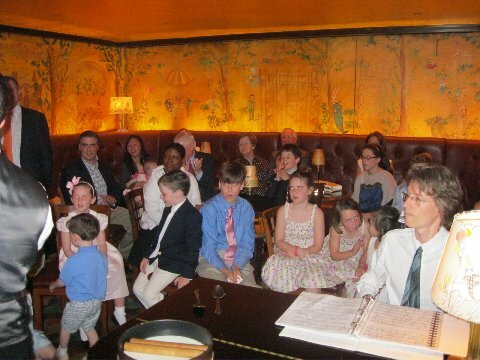 Last May, Jeff and I performed at a private party for kids at the Carlyle Hotel in the gorgeous Bemelmans Bar. Our set of music and magic concluded with an impromptu sing-a-long complete with My Favorite Things, Somewhere Over the Rainbow and Frere Jackque that I will never forget. I’m sure Bobby Short was smiling somewhere! Here are a few pictures from the event. Sorry there are none of Jeff, but stay tuned – more shots will be added later. Welcome to the maiden voyage of One Musician/One Magician! For the past several months, Jeff and I have been amusing ourselves by exploring the intersections of our respective arts, and we are delighted to present some of our findings today. Our primary goal is to create music you can see and magic you can hear. We began with the premise that both magicians and musicians create illusions of weight, space, and time. The parallels and possibilities were so immediately apparent that it was a bit of a challenge to decide where to start. Magic plays with pattern, expectation and surprise to achieve its effects, and most composers and improvisers hope to achieve similar goals in their music. Both magic and music are disciplines rooted in the imaginations of performers and audience alike. One large and obvious difference, however, is that music is entirely invisible. All of the elements that make music work (i.e. form, phrasing, repetition, variation, tension, resolution) may or may not be heard, felt, or perceived in the mind of the listener. For the magician’s audience, it is much easier to see that a coin has appeared or vanished, a juggling pattern has been disrupted, or a deck of cards seems to defy gravity. So, by attaching a visual to various musical elements (beat, accent, phrase, form, for example) it is my hope that the kinesthetic imagination can be activated. The soundtrack for today’s performance comes from composer Claude Debussy and jazz pianist Chick Corea. Debussy’s Children’s Corner Suite evokes soaring mountains, adventurous (and sleepy) elephants, skittish dolls and comic cakewalks. Each piece is a study in itself of a specific aspect of time, space and energy. Corea has written some wonderfully evocative pieces as well, many of which seem to me to be more ‘about’ children than ‘for’ them. We have found these pieces especially conducive to juggling balls, vanishing coins, and gravity-defying cards. Today, we are using Corea’s music to introduce the magic tricks which will be tied to specific musical elements. 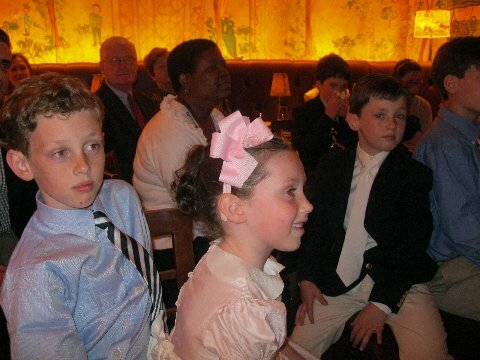 The listener will then have the opportunity to continue the fun in his or her own imagination to the music of Debussy. Enjoy the show!